How can educators of middle school students promote authentic language arts skills? By engaging young people in meaningful writing activities that relate to their lives. This book features twenty-four classroom-ready activities that incorporate adolescent interests into writing assignments supporting Common Core State Standards for English Language Arts. Students are empowered to write about what matters to them—their identities, their goals and dreams, their struggles, their relationships. Authors Deb and Jim Delisle prove that successful middle school language arts instruction can—and should—be fun. 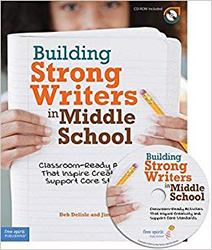 Complete with step-by-step directions and student examples—and developed and tested in public and private classrooms with students of varying abilities—Building Strong Writers in Middle School can help inspire students to explore their personal thoughts and beliefs while building proficiency in core language arts concepts. With writing now being required across the curriculum, middle school language arts instruction is more important than ever.